Ok, are you ready for this? I know… WOW. 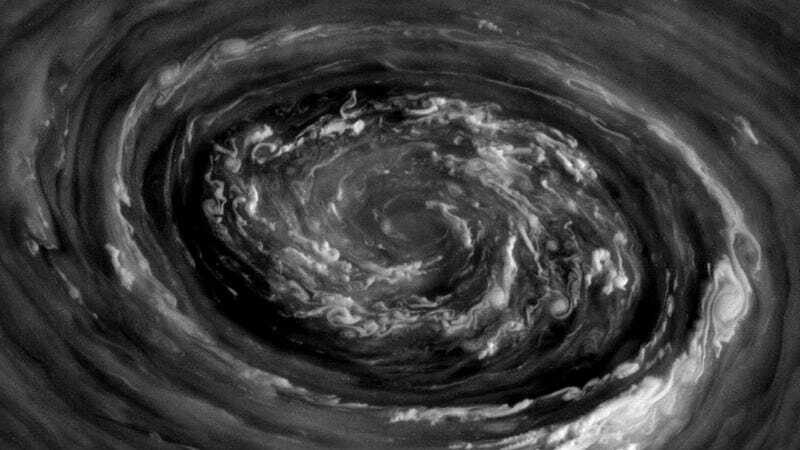 This swirling maelstrom of clouds is what was seen over Saturn's north pole yesterday, November 27, by NASA's Cassini spacecraft. This is a raw image, acquired in polarized light, from a distance of 238,045 miles (383,097 kilometers)… all I did was remove some of the hot pixels that are commonly found on Cassini images taken with longer exposures. My attempt at a color composite can be seen below, plus another treat. Captured with wider angle in this image the hexagon structure can be made out as well as the vortex, which sits at the center just over the pole. Saturn's hexagon is about 25,000 km (15,500 miles) in diameter… large enough to fit almost four Earths inside. This image was also acquired today. It's been a few years since we've gotten such a good look at Saturn's north pole… thanks to Cassini's new orbital trajectory, which is taking it high above the ring plane and poles of Saturn, we now have the opportunity to view the gas giant's dynamic upper latitudes again. I'm sure this is just a taste of what's to come! This post by Jason Major originally appeared on Universe Today.